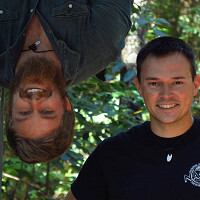 Using their emergency preparedness and engineering skills, Wazoo Founders Dustin Hogard and Nick Blackman designed sleek survival bracelets that are equipped to handle just about any serious situation. And they are proudly Made in the USA. 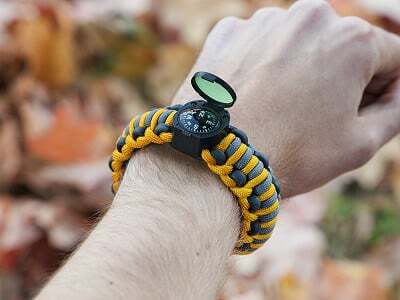 Their American-made paracord bracelets have the emergency tools woven inside, creating a low profile that’s easy to wear. Originally used in parachute suspension lines, paracord is a lightweight, tough nylon rope. Dustin and Nick are both avid adventurers whose first-hand search and rescue experience informed which tools are included. From basics like a compass or antibiotic cream, to more serious gear like a fire starter or the means to catch food or build shelter, you’ll be prepared. If the time comes, unravel the paracord to access whichever accessories you need. Once the bracelet is unraveled, it doesn’t go back together. But if you really need it, you’ll be glad it was there to save your wazoo. Dustin H. & Nick B.
Hello everyone! 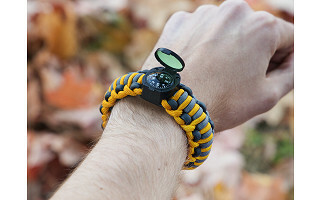 We're proud to introduce the Wazoo Survival Bracelet to The Grommet. We'd be happy to answer any questions you have! I wanted to add something to what Blaise said in the end of the video. Our products are made with a passion and a purpose: to save lives! If the circumstance arises that requires you to dismantle it in order avoid serious danger, don't think twice. Tell us what happened, send back the scraps, and we'll make sure you get re-equipped for your next adventure. @Dustin H. & Nick B. Can you provide more info on the sizing I didn't see the length of each size bracelet. I found how to measure for the right size but didn't see measurements for each size bracelet. Awesome idea!!! Hi Brian, I'll let Dustin and Nick comment on sizing specifically, but we are working to get the corresponding sizes on site to avoid further confusion. Stay tuned! UPDATE: Here is the sizing info. It will be on site shortly. @Robert Did you make sure to pay close attention to our measuring guide? You want to make sure you measure tight and with the proper tool as outlined in the guide. @Jeannie The Grommet is considering offering larger sizes, so thanks for feedback! @marjorie Thanks for the support and enthusiasm! I'm sure he'll love it. I hope he'll share some pictures of his adventures with us. Marjorie, you are making us blush. Thanks so much for the kind words! I know your nephew is going to love Wazoo. And yes, please share pictures with us! do you know of anyone traveling with this gear through airport security. I would like to travel with this in S America. @barry It's always best to check TSA guidelines since they regularly change and compare it to the list of items in the corresponding bracelet. As a company, for liability reasons, we cannot encourage you to do it, nor will we be held responsible for anything that occurs if you attempt to. Now with that legal mumbo jumbo out of the way, I can say that there are hundred of people that travel regularly with these and we've never heard any reports of having issues with them.Use sound judgement. @Mike No way you'll get through security with a knife. Why take the chance? Put it in your checked luggage. @Erica The small ceramic blade is removable so if you plan to travel with it you can always remove that portion. @Anita Sorry for the confusion. We are working to update these details. The best way to compare them is to look at the "tear down components" photo for each. Those will accurately show the individual items in each bracelet (NOTE: we are currently working to update the Adventure's photo since it does not actually have a wire saw in it). @Anita You can see below in a comment to Michael that I put together a bullet point list with the components so you can compare them. Hope this helps you! How do I find out what items each bracelet contains? Hi Michael, you can click on the photos beneath the video to get a break down of the tools in each bracelet. Great idea. Will buy two when I have the $$$ ! Thanks for the kind words, Patricia! Now you can be doubly prepared for survival! @margaret Great question! As with all of our incorporated tools, there is no one purpose. We incorporate multi-functional components that can be adapted to the needs of the individual and/or environment. It's general purposes can range from a straw (to drink water from a solar still or hard to reach place) to an elastic material (for snares, spearfishing device, slingshot, etc). You can see a picture on the Adventure and Mountaineer Bracelet listings that shows a slingshot we made. I want to thank you guys for creating such a useful and important tool for us outdoorsmen. Since I purchased my adventure bracelet, I have had to oder 2 more for friends. I show it off every chance I get and its the first thing I put on In the morning! hands down the best money I have ever spent on any of my gear. as a maritimer we spend the majority of our time out doors this is a must for everyone. @Bob Thanks so much for your kind words! We strive to make the best products possible, using the highest quality components, and it doesn't get much better than when that truly resonates with a customer. We really appreciate your support in sharing this feedback here for everyone else to see. Hope you'll send us some pictures of your "Adventures" up in New Brunswick and feel free to contact us anytime you have any questions or concerns. Everyone needs to remember that, during survival situations, having survival gear can make you the target of those who lack such gear. That is not a reason to be unprepared, but one should not be too obvious. I prefer my survival gear to be covert and orange stands out too much. Do you plan to offer solid gray (my preference) or solid black. I would also like a size that I can put around my ankle (10") where the bracelet is not as noticeable. Hi J.R., it's something to certainly be aware of. I can also think of no better advertisement than: this is so good people will want to kill you for it. More sizes and colors could be on the way, and if they are, we will be sure to update you! 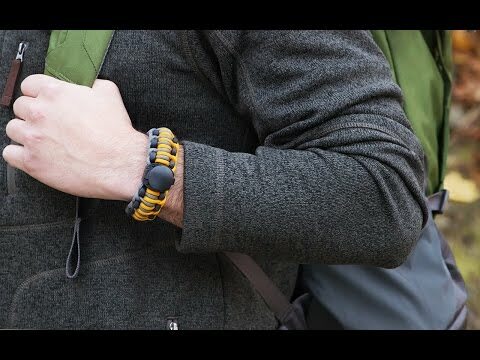 Using their emergency preparedness and engineering skills, Wazoo Founders Dustin Hogard and Nick Blackman designed sleek survival bracelets that are equipped to handle just about any serious situation. And they are proudly Made in the USA. 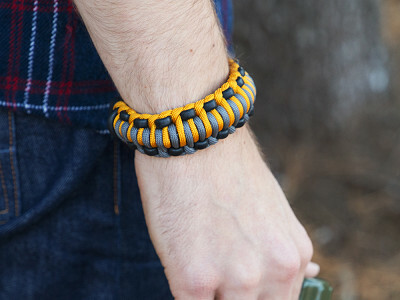 Their American-made paracord bracelets have the emergency tools woven inside, creating a low profile that’s easy to wear. Originally used in parachute suspension lines, paracord is a lightweight, tough nylon rope. Dustin and Nick are both avid adventurers whose first-hand search and rescue experience informed which tools are included. From basics like a compass or antibiotic cream, to more serious gear like a fire starter or the means to catch food or build shelter, you’ll be prepared. 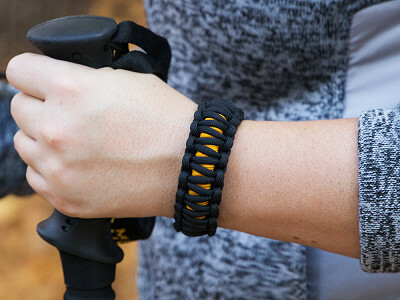 If the time comes, unravel the paracord to access whichever accessories you need.